All small size dollars (1929+) are still in circulation. Previous series (1861+) are valid and exchangeable, but their collector’s price is much higher than face value. 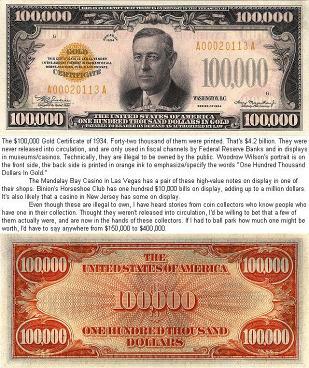 The only canceled note - 1900 $10,000 Gold Certificate - on the picture. These notes became available in 1935 when the Treasury Warehouse caught fire. As the fire spread, some of these notes were thrown out onto the street to keep the fire from spreading. Many were scorched or burned. Passersby quickly took advantage of the situation, and spirited away. The collector’s price of this note is about 1 000 US$. Notes above the $100 denomination ceased being printed in 1946 and were officially withdrawn from circulation in 1969. These notes were used primarily either in inter-bank transactions or by organized crime; it was the latter usage that prompted President Richard Nixon to issue an executive order in 1969 halting their use. With the advent of electronic banking, they became less necessary. 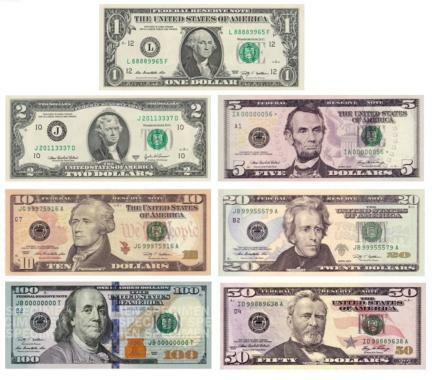 Although they are still technically legal tender in the United States, the collector’s price of high-denomination bills is much higher than face value. Each note had a "maturity date," or the date that the owner could take it to the bank and collect the face value of the note plus some interest, so almost all Interest Bearing notes were returned to banks and taken out of circulation. There were none left to collect, so now they are very rare. 3/ Compound Interest Treasury Notes(1864-65). An exceedingly rare class of currency from a numismatic standpoint, were created in the middle of the Civil War, issued in denominations from $10 through $1,000. Each note had an expiration date, at which time the full amount would be paid by the Treasury. Meanwhile, notes increased in theoretical value as they were held and passed from hand to hand. 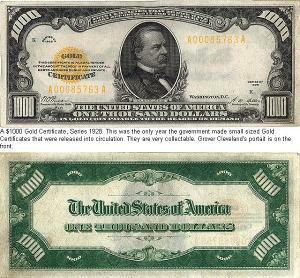 Refunding certificates issued only in the $10 denomination, was a type of interest-bearing banknote issued by the United States Treasury. The Refunding Certificate originally promised to pay 4% annual interest in perpetuity till 1907 when fixed to $21.30. Treasury Notes were issued from 1890 to 1891. You could turn them in for gold or silver coins. They were also called Coin Notes. 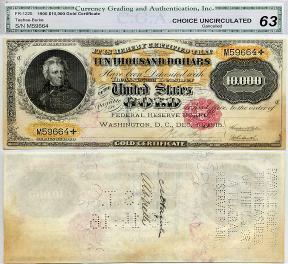 Banknotes issued by banks chartered by the United States Government. The notes were backed by United States bonds the bank deposited with the United States Treasury. A small-size example of these notes was quite similar in overall appearance to most of the Federal Reserve Notes that circulated through the 1990s, except that it was stamped with the name of the issuing commercial bank, and bore the signatures of that bank's president and cashier. 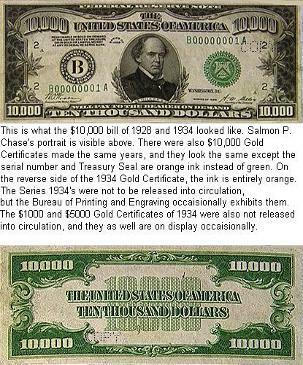 Used from 1882 to 1933 in the United States as a form of paper currency. Each certificate gave its holder title to its corresponding amount of gold coin. Therefore, this type of paper currency was intended to represent actual gold coinage. In 1933 the practice of redeeming these notes for gold coins was ended by the U.S. government and until 1964 it was actually illegal to possess these notes (in 1964 these restrictions were lifted, primarily to allow collectors to own examples legally, however the issue technically converted to standard 'legal tender' with no connection to gold). The first permanent kind of federal paper money, the original "greenbacks." Previously, what the Treasury had issued in wartime were bonds and interest bearing notes. These were also issued during the Civil War, but then the innovation was introduced of Legal Tender Notes that paid no interest but were intended for "all debts public and private, except duties on imports and interest on the public debt. Silver Certificates $1 & Federal Reserve Notes $2,5,10,20 brown seal and numbers issued for Hawaii in case of a Japanese invasion. HAWAII was printed vertically on the left and right side of the obverse and also horizontally . Silver Certificates yellow seal - Issued as payment for Allied troops in North Africa about to begin their assault into Europe. Both of these types of notes could be declared worthless if they fell into enemy hands. 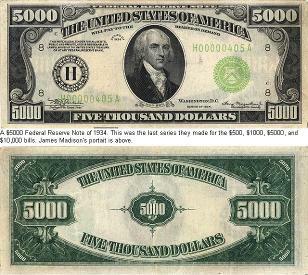 · $500 Note* (Face) - William McKinley (25th U.S. President) (Back) - Numeral 500 and the ornamental phrase "Five Hundred Dollars"
· $1000 Note* (Face) - Grover Cleveland (22nd & 24th U.S. President) (Back) - Numeral 1000 and the ornamental phrase "One Thousand Dollars"
· $5000 Note* (Face) - James Madison (4th U.S. President) (Back) - Numeral 5000 and the ornamental phrase "Five Thousand Dollars"
· $10,000 Note* (Face) - Salmon Chase (U.S. Treasury Secretary under Lincoln) (Back) - Numeral 10,000 and the ornamental phrase "Ten Thousand Dollars"
· $100,000 Note* (Face) - Woodrow Wilson (28th U.S. President) (Back) - Numeral 100,000 and the ornamental phrase "One Hundred Thousand Dollars". This note never appeared in general circulation, and was only used in transactions between Federal Reserve Banks.